The central span of the Edmund Pettus Bridge in April 2010. The Edmund Pettus Bridge is a bridge that carries U.S. Route 80 Business (US 80 Bus.) across the Alabama River in Selma, Alabama. 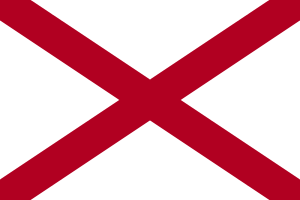 Built in 1940, it is named after Edmund Winston Pettus, a former Confederate brigadier general, Democratic Party U.S. Senator from Alabama and Grand Dragon of the Alabama Ku Klux Klan. The bridge is a steel through arch bridge with a central span of 250 feet (76 m). There are nine large concrete arches supporting the bridge and roadway on the east side. An earlier bridge at the same construction was built in 1885. It was a two-lane wooden bridge designed to carry mule loads of cotton. A swing bridge, it had to be opened by hand. The Edmund Pettus Bridge was designed by Selma native Henson Stephenson and opened to traffic in 1940. Alabama policemen prepare to assault peaceful demonstrators at the Edmund Pettus Bridge during Bloody Sunday in 1965. In 1965 voting rights for African Americans were a contentious issue. In Selma, Alabama, voting rolls were 99% White and 1% African Americans . The case of Jimmie Lee Jackson showed how African Americans were treated; as state troopers and other locals started a fight with some 400 African Americans demonstrators, Jimmie Lee Jackson was shot in the stomach, and he died eight days later. As word reached the people, including Martin Luther King, Jr., SCLCs Director of Direct Action James Bevel strategized a plan for a peaceful march on the state's capitol, which required crossing the bridge. There were many acts just like this one that involved killings, and many more that involved economic and health problems. In March 2015, on the 50th anniversary of Bloody Sunday, U.S. President Barack Obama, the first African-American U.S. president, along with other U.S. political figures such as former U.S. President George W. Bush and Representative John Lewis, and Civil Rights Movement activists such as Amelia Boynton Robinson (at Obama's side in a wheelchair) led a march across the bridge. An estimated 40,000 people attended to commemorate the 1965 march, and to reflect on and speak about its impact on history and continuing efforts to address and improve U.S. civil rights. ↑ "Edmund Pettus Bridge". National Register of Historic Places Program. National Park Service. ↑ "AMERICA'S GREAT OUTDOORS: Secretary Salazar, Director Jarvis Designate 13 New National Historic Landmarks". US Department of the Interior. Retrieved 2013-03-11. 1 2 3 O'Neill, Connor (March 6, 2015). "How the Design of a Selma Bridge Became a Metaphor for the Civil Rights Movement". Slate. Retrieved March 12, 2015. ↑ "PETTUS, Edmund Winston - Biographical Information". Bioguide.congress.gov. 1907-07-27. Retrieved 2010-08-22. 1 2 Peeples, Melanie (March 5, 2015). "The Racist History Behind The Iconic Selma Bridge". All Things Considered. ↑ Desmond-Harris, Jenee (March 9, 2015). "Inside the fight to strip a KKK leader's name from Selma's Edmund Pettus Bridge". Vox. Retrieved March 11, 2015. ↑ "We Shall Overcome - The Cost". Nps.gov. Retrieved 2010-08-22. ↑ Sheila Jackson Hardy; P. Stephen Hardy (August 11, 2008). Extraordinary People of the Civil Rights Movement. Paw Prints. p. 264. ISBN 978-1-4395-2357-5. Retrieved March 6, 2011. ↑ Jet - Google Books. Books.google.com. 1995-03-27. Retrieved 2010-08-22. ↑ Jet - Google Books. Books.google.com. 2005-03-28. Retrieved 2010-08-22. ↑ Heath, Thomas (1996-07-01). 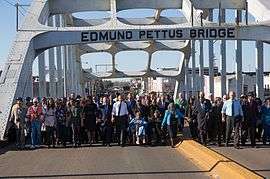 "After Three Decades, Selma Sees the Light; Torch Crosses Bridge Between Peace, Violence". Pqasb.pqarchiver.com. Retrieved 2010-08-22. ↑ Baker, Peter; Fausset, Richard (March 7, 2015). "Obama, at Selma Memorial, Says, 'We Know the March Is Not Yet Over'". The New York Times (March 7, 2015). Retrieved 10 March 2015. ↑ Miller, Marilyn (June 1, 1989). The Bridge at Selma. Silver Burdett Press. ISBN 9780382068263. Wikimedia Commons has media related to Edmund Pettus Bridge.